Arrive Saturday, 16-FEB-02. Drive to Ke Iki Beach Bungalows arriving at sunset. Jump into shore break just to get wet. Sunday: walk down to "Off the Wall" to catch some very nice waves. The surf report (596-SURF) said the waves were 1-2 feet, but, it seemed like the faces of the sets were 4-5 ft. There were many boards and boogie boards spread out. There was a pro football player swimming with one of those lid's red kick boards, but, using it more like a one handed paddle. Counting him, I saw a total of 3 body surfers during the whole week. Anyway, it was a great first day. Many rides and I started to get used to the idea of rocks here and there (fewer at Off the Wall). Monday: surfline 1-2 ft. Since there was a swell predicted later in the week we did the whole tourist thing: Diamond Head, Bishop Museum, Arizona & Bowfin. (hopefully more on that later). Tuesday: surfline: start at 1-2 and gradually increase. I went back to Off the Wall, but down closer to "Back Door Pipe". The waves are a good bit bigger, but still not huge. Big enough such that you need to pay attention when swimming out. More good rides, getting psyched for the big ones. Wednesday: high surf advisory. surfline says it will increase to 8-10. Go to Off the Wall, only one board is there and only a handful are at Pipe. The waves are pretty big and there are No Swimming signs. It is also very messy. 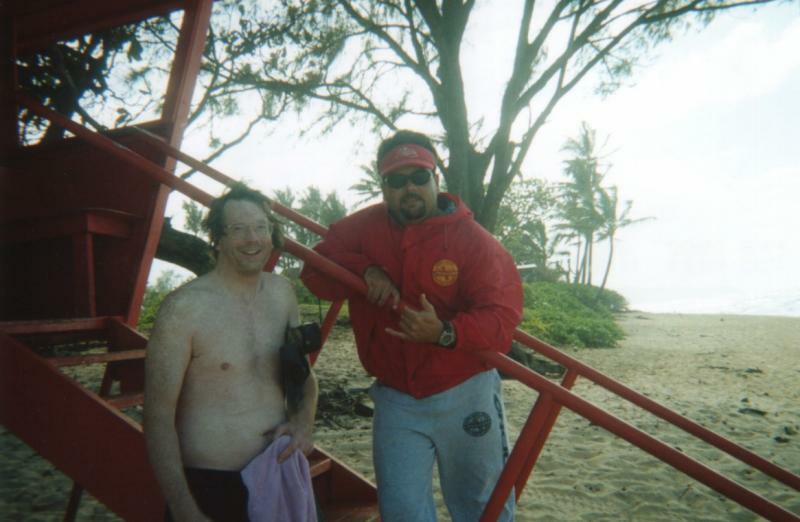 Johnie Angel, the life guard estimates the waves are around 5 feet. The faces look more like 10 to me. Johnie recommends that I do not go out, but, we talk for a while. I tell him I've had my fins for 30 years and I've been out in storms like this. He checks out my ankle braces to keep my full foot fins on. Since there is only one board and no other swimmers at Off the Wall, he says he will keep an eye one me. Off into my first interesting ocean. I seem to always be swimming out as a set is coming in. I get a work out, it takes me a minute to catch my breath. When it is messy like this, the corners are easy to catch. I get my first great ride: lots of power, nice steep drop, and good lateral distance. Back out, I also get 1/2 of a wave - things are not breaking cleanly so, I catch part of a wave to the outside and it just does not connect to the rest of the wave. Back out for a second glorious shoulder. At the bottom I steer and and ride it in until I wash up on the sand. I come in and Johnie liked what he saw. Always nice to be validated. He saw all three rides and says it was a shame I did not connect on the middle shoulder. I'm psyched, but, Cornelius is waiting for lunch. After lunch I head back. A second guard is talking with Johnie. They both claim it is not a good day for body surfing. The only people in the water are 4 boards at Pipe. That's one good thing about a messy ocean, surfers don't go in. Anyway, Johnie makes sure I can see it will be much more of a workout. I tell him that as soon as I have doubts I will head in. I head in and indeed it is a much harder workout to get out. I get out, I'm fine. I sprint along to get to the top of a huge wave, but, it has that feeling of falling down the curl instead of cutting down it. I pull out. The waves in a bit are curling thickly and crunching. The waves out a bit are crumbling at the top with great shoulders. I head out to wait for my mega wave. A few minutes go by. One chopper goes by at a good distance. a few more minutes go by. Then a second chopper comes down the beach very low, it slows down right over me and heads into the beach and lands. I will be damned if I'm going to be rescued! I wait until I do not see any big swells coming and head for shore. 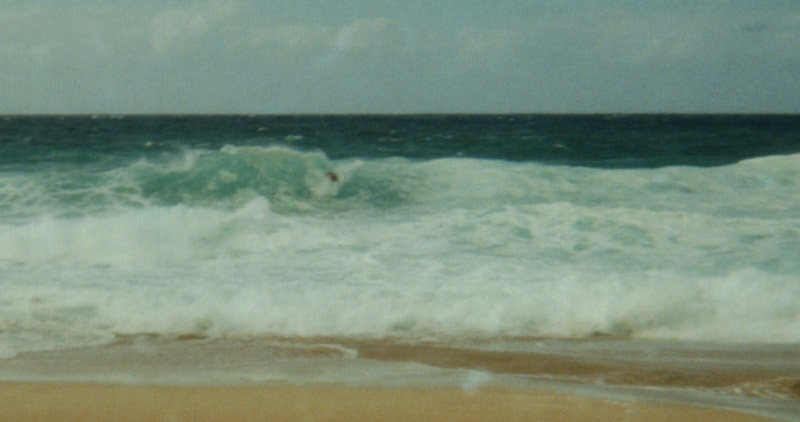 I catch a very sloppy inside wave, perhaps four feet. (see above) When I get in, it is obvious there is no rescue afoot. Johnie also thought that the chopper slowed down right over me, but, it was evacuating someone from a traffic accident on Rte 83. Still, I've worked hard enough. That was my my best shot at a huge wave. Johnie says that the big ones might be 9', but, estimating waves heights seems to vary so much from one beach to another. Anyway, they were big and Johnie says as a consolation that I swam out in some of the narliest surf the North Shore has to offer. 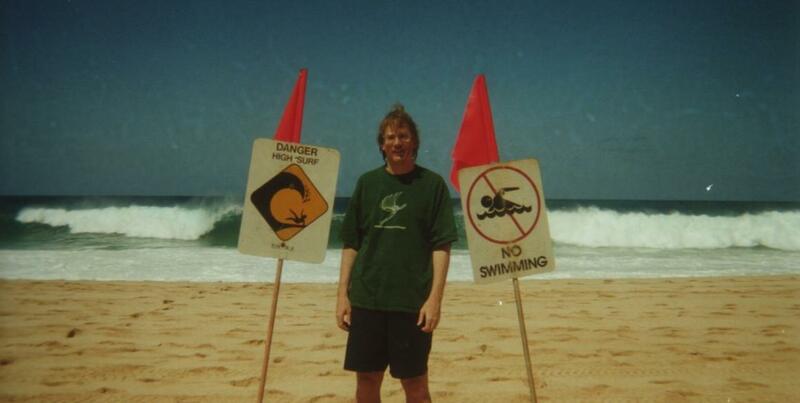 Thursday at 7AM I'm heading for the Banzai Pipeline. It is messy and things are breaking all over, but, I want some company, even if they are on boards. When I first get out (thru another set) I keep going into safe territory to catch my breath. It is a good workout. I hangout on the periphery of the two dozen boards, just a little down the Pipeline. Interesting things are breaking there, too. I catch a shoulder on a wave with a few ripples in it. A board comes down underneath me. It's messy and I do not want to be in the churn with him so I cut as hard as I can back through the wave. That leaves me right in front of the waves. I sprint out but I don't quite make it under the first one. The curl comes down on my fins and drags me down what feels like about 12 to 15 feet. The water is all foamy and you don't quite get full "traction". I hurry up to the surface and have a few seconds before the next wave. I'm not going to make it thru it either, but, I make a good deep dive and make it back up through minor churn and sprint out making under the next one - close enough to feel it pulling me back, but I make it thru. I swim back out, there is a mild current and we are all drifting. I'm hanging out on the border of the boards again, but now the swarm comes my way. I look to see that I'm now dead in front of the Gotcha-Pipline Pro tent they have set up. I move back to the edge of the boards - now there are well over three dozen and to stay out of the thick of things I am being pushed further down the Pipe. Time to catch what ever I can. A good size wave comes with the wide crest just in front of me. No need to worry about anyone cutting in front of me, but, no shoulder either. There is nothing like the rush of shooting straight down a big wave. I get to the bottom out in front a bit. I make it thru the first bounce and then a second bounce and I'm thinking I'm going to get close to the beach, but, the churn catches me and I get a bit of a roll. 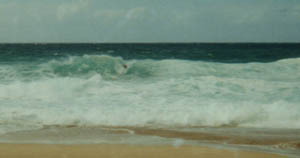 Now I'm in the rip that goes out between Pipe and the Ehukai sand. 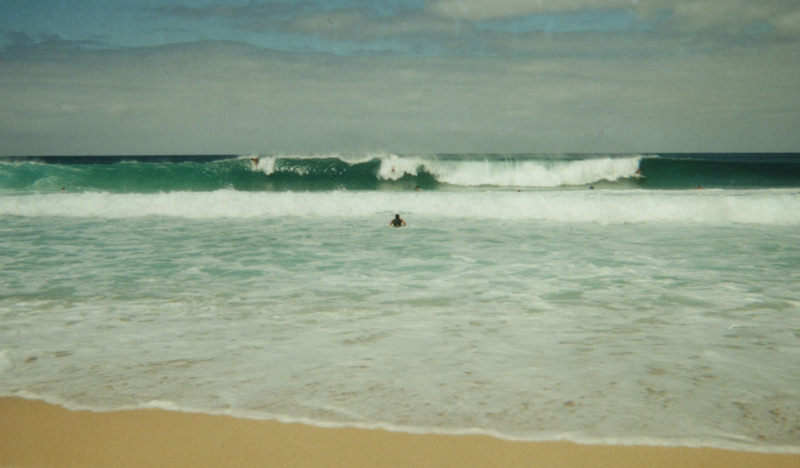 I got the first wave of a set, so, I swim with the white water for the next two, getting rolled a bit each time. Now, I just decide to hang out for a bit. It seems like my choices are to swim down to Ehukai to get out of the rip and then in, or, just sprint in. I choose to sprint, getting aided a little bit by those little waves that happen in a current. I get in, I'm breathing hard, but, not dangerously so. 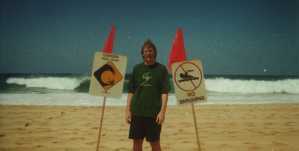 I've caught a good sized wave at the Banzai Pipeline. Cornelius and I spend some of the day watching the Gotcha Pipeline surfing competition (same size, but the curls have cleaned up) and some time playing in the foam in front of waves. Late in the day we get called out by the life guards (more on that later). The high surf advisory is canceled. Friday: head out to Off the Wall at 7AM. Things have cleaned up and the size has fallen off, but not too much. With my great timing again, I swim out thru a decent sized set. I'm winded again when I get out. I head what seems to be a safe distance out and just rest for a minute. I move back in. A swarm is down at Pipe and there are about a dozen of us at Off the Wall. I catch my first wave, nice and powerful, great smooth shoulder and decently long. Again, I need to swim out through a set with deep dives and decent churn. I catch my breath. We are waiting and then a huge set comes and it is going to break another 20 yards out. I sprint out and just make it under the curl. It is followed by an even bigger wave, I sprint out some more. The boards made it, too. I think that is the sort of set you can wait 20 minutes for and still not see again, but, the boards stay out there. I move back in a bit. Another nice big beautiful wave comes for me, Nice, powerful rushing down the shoulder, I cut back and ride the white water in close to the beach. Time for Starbuck's & breakfast. We need to leave after lunch, so, I have one last session. It has calmed down from the morning, so, I wait for a big set, but, I don't want to wait too long. There is that last wave syndrome where you wait for a big one while things are calming down. So, I decide to just take the next decent size wave . No shoulder on this one, but, I do love that shoot straight down the face. This time I make it through the first bounce and ride in close enough to take my fins off and walk in. I'm lucky & happy to have had decent surf. I did not catch the wave to end all waves. I might have had that Wednesday, but, it was not to be. I've been thinking about this trip for 5 years. I got my money's worth. I am good enough to play in the big waves. I think I could enter the Pipeline contest and not embarrass myself. Things to ponder. I plan to put up a web page about the whole trip with pictures, too.